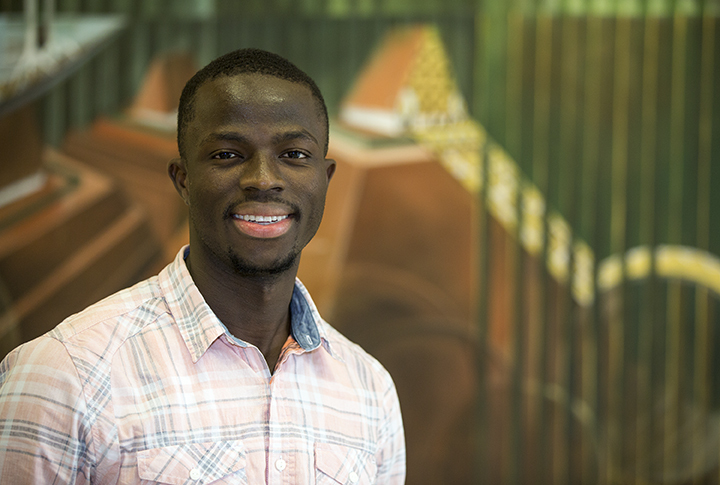 Getting down to business is exactly what University of Houston-Downtown (UHD) student Mustapha Nyallay is doing in his new role as president of the Student Government Association (SGA). Nyallay, who started his term June 1, 2016, is making great strides within the SGA administration and on campus. He has increased cabinet officers to 70 members and is collaborating with other student organizations to bring the student body together. "It's important that we serve as a source to bring students and campus organizations together," said Nyallay. "We are the bridge to connect everyone, and we want to make certain that all student voices are heard." Nyallay is eager to take several SGA initiatives forward. His top priorities for the 2016-17 academic year include increasing SGA's presence on campus and heightening student involvement and engagement. He also wants to boost Gator pride in all areas of campus involvement in the hopes that retention and enrollment rates will rise. "The more involved students are in this institution, the easier it will be to retain them and recruit new students," he said. Other goals include increasing volunteerism and promoting service learning. Already this year, Nyallay and his fellow officers are making an impact university-wide. Aside from providing vital information at booths scattered across campus during UHD's Welcome Week, SGA has also conducted a non-partisan voter registration drive ahead of the Nov. 8 Election Day. The effort to increase community involvement through civic engage­ment on campus was part of Nyallay's cam­paign plat­form when he ran for SGA pres­i­dent in spring 2016. "Millennials continue to have the lowest voter turnout of any age group," said Nyallay. "At UHD we want to help change that. We believe increasing political engagement is the remedy." SGA will host Walk 2 Vote, an initiative that aims to empower voter participation and increase civic engagement among college students. The march will be held on Wednesday, Oct. 26. SGA began the Walk 2 Vote initiative in 2012 and has continued it annually. The Walk 2 Vote campaign is responsible for registering more than 2,500 UHD students to vote in 2012, with another 1,300 students registered to vote in 2014. In 2012, 55 percent of the UHD student body was registered to vote, compared to the national university average of 5 to 15 percent. Nyallay will be busy this year as he serves as president, delves in his major and prepares for the Law School Admission Test (LSAT). He is excited to serve fellow students and the entire UHD community for the remainder of the academic year. "I'm thankful to the student body for supporting and believing in SGA's mission," he said. "Myself and the entire SGA, who are experienced leaders in their own right, are working in the best interest of the students, for the students." Nyallay emigrated from Sierra Leon in West Africa and moved to the United States to pursue higher education. He is one of 16 children and is a first-generation college student. "My parents never attended school, and I'm the first and only one to travel to the United States," he said. Nyallay is also a member of UHD's Pre-Law Association, and Black Students Association. Before being elected as SGA President, he served on SGA as his junior class senator. Outside of SGA, he interns at the Harris County District Attorney's Office. Nyallay is expected to graduate May 2017 and plans on pursuing law school and eventually practicing immigration or criminal law.